In Ribbit King (ケロケロキング Kero Kero Kingu), the fate of the planet rests on your ability to get frogs into holes. This is the game of Frolf, and, as Scooter, you must play it across 20 different courses on five different worlds. Power supplies are running out, and to save them, you must win the coveted Super Ribbinite. Choose from 13 odd characters and more than 10 frogs to collect items and points through Frolfing matches. Become the Frolfing Champion in Story mode or Versus mode, which supports up to four players. 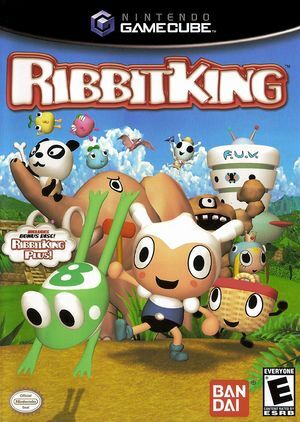 The Japanese and North American versions of the game include a bonus disk titled Ribbit King Plus!, which includes cartoon shorts which were originally aired on TV Tokyo. The graph below charts the compatibility with Ribbit King since Dolphin's 2.0 release, listing revisions only where a compatibility change occurred. This page was last edited on 27 July 2018, at 11:49.